A versatile paper for general black and white enlargements, this 10-sheet box of 11 x 14" Multigrade IV RC DeLuxe Paper from Ilford features a satin 25M surface finish that reaps the glare-reducing benefits of matte papers while still retaining the depth of glossy. Its bright white base tint delivers a cool-to-neutral image color, and it responds well to select toners, especially selenium, for increasing the effective print lifespan. 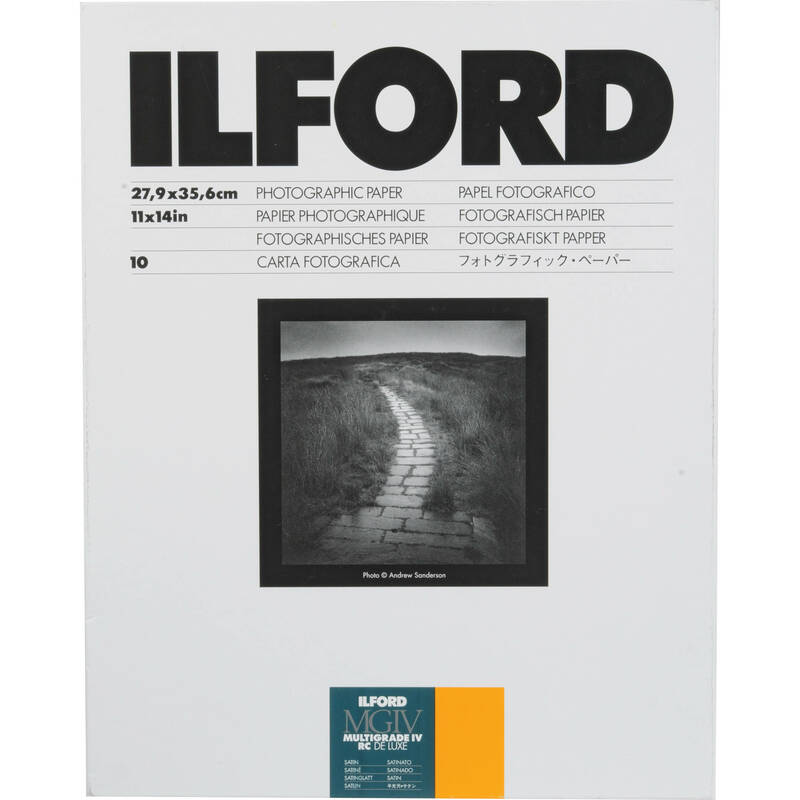 As a variable contrast paper, it responds to seven full grades of contrast during printing, when using multigrade filters, and it is suitable for printing both conventional black and white negatives as well as chromogenic black and white negative films. Additionally, the paper can be processed using standard black and white chemistry in either trays or using machine processors. Box Dimensions (LxWxH) 15.0 x 11.95 x 0.75"
Multigrade IV RC DeLuxe Paper (Satin, 11 x 14", 10 Sheets) is rated 5.0 out of 5 by 2. Rated 5 out of 5 by Keren2391 from Just what the doctor ordered This paper is the only paper I purchase for Darkroom use. Minor light leaks can be expected as with any paper purchase order, but nothing that will stop me from continuing to buy this product. Rated 5 out of 5 by Anonymous from I love this paper! The satin finish looks so good on display and so easy to use in the darkroom. The paper showed up on time and was exactly what I wanted.